Chateau Ducal is a castle in Caen and has been classed as a Monument historique since 1886. It was built in 1060 by William the Conqueror, who had conquered England in 1066. Later, his son had built Saint Georges church, a keep and a huge hall for the Duke Court. The castle was built on the hillock and is now amidst the city. It covers an area of 5.5 hectares and is one of the biggest in Western Europe. Till today, it remains an essential feature of Norman strategy and policy. Free entry to the castle but the various attractions within the castle have separate entry fees. Love this? Explore the entire list of places to visit in Caen before you plan your trip. Fancy a good night's sleep after a tiring day? Check out where to stay in Caen and book an accommodation of your choice. How popular is Chateau Ducal? People normally club together La Colline Aux Oiseaux and Eglise Saint-pierre while planning their visit to Chateau Ducal. Excellent historical place and free to visit. Take your time and walk the entire place. Have done amazing views from some of the towers. An interesting place for tourists. A great spot to grab a picknick, to get a brief view of Caen or just to relax in the sun. You also got a museum in this place, by entering about 100 meters to the right. Great spot. Lovely place, great to go for a walk about and see all the great views. 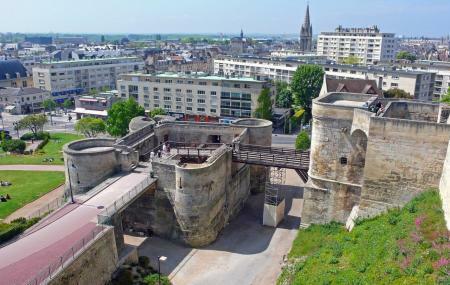 Well preserved fortress in the center of Caen. The fortress is very spacious and clean with museum and gastronomy. Very nice viewpoints on the city.